In case you have heard, chat bots are the Next Big Thing, and Microsoft got the ball rolling last month during its Build 2016 conference with its Cortana-enhanced bots for Skype. Now these same bots are coming to the Web and Mac too. On the Mac, you add them the same as any other contact, except you’ll now see an option to “Add Bot” in addition to real live humans. On the Web, there’s a new “Discover bots” section. 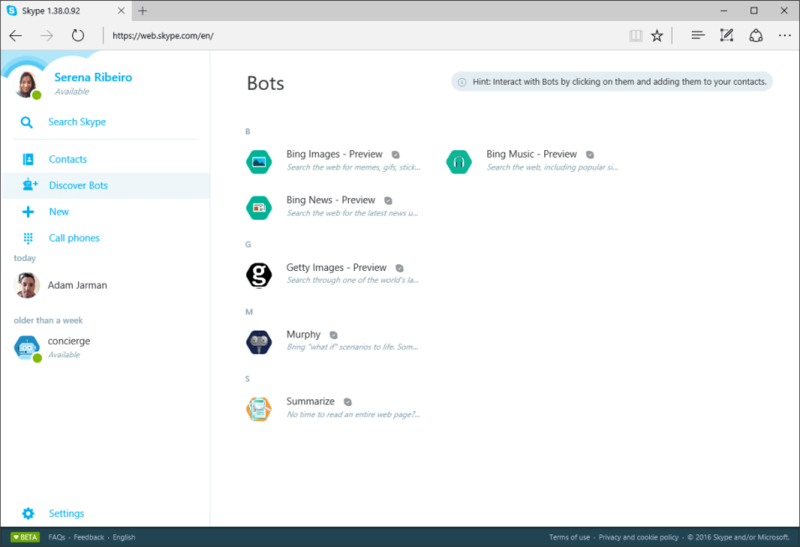 So far those bots include three for Bing Search, one for Getty Images, one to help you ‘summarize’ Web pages and articles, and a regular old chatbot named Murphy. That’s not quite the extensive list that Messenger has already amassed, but perhaps that’s not surprising given Facebook’s ubiquity. In all, Skype bots are now available on the Windows, OS X, Android, and iOS. Poor Windows Phone users.